From Social Media and Young Adults, the latest in a series of reports undertaken by the Pew Research Center that highlight the attitudes and behaviors of the Millennial generation (a cohort we define here as adults ages 18 to 29). 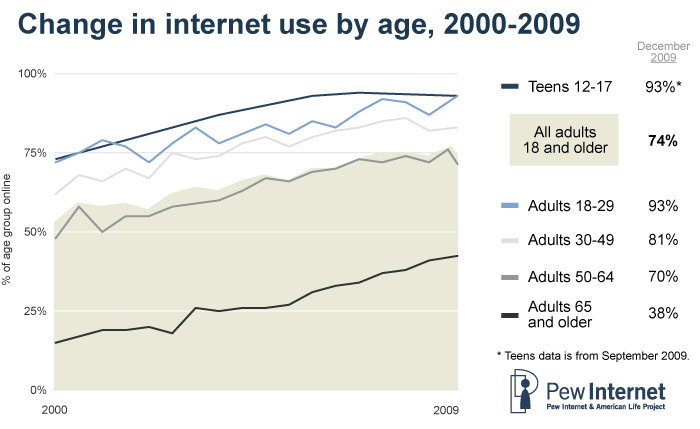 The Pew Internet & American Life Project has conducted more than 100 surveys and written more than 200 reports on the topic of teen and adult internet use, all of which are freely available on our website, pewinternet.org. This report brings together recent findings about internet and social media use among young adults by situating it within comparable data for adolescents and adults older than 30. Teens data is from from a survey we conducted between June 26 and September 24, 2009 of 800 adolescents between ages 12 and 17. Adult numbers are drawn from a survey we conducted between August 18 and September 14, 2009 of 2,253 adults (age 18 and over).